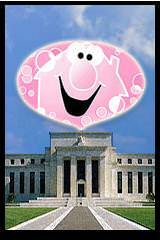 The Fed and Your Money; Who Called the Housing Bust? The modern banking system manufactures money out of nothing. The process is perhaps the most astounding piece of sleight of hand that was ever invented. Banking was conceived in iniquity and born in sin. Bankers own the earth. Take it away from them, but leave them the power to create money and control credit, and with a flick of a pen, they will create enough money to buy it back again. But if you want to continue as the slavers of bankers and pay the cost of your own slavery, let them continue to create money, and to control credit. –Sir Josiah Stamp, Director The Bank of England. Question: Why aren’t you rioting in the streets over this? Who Predicted the Housing Bubbles? One of the best sentiment gauges for precious metals is whether investors are paying a premium, or if they are buying precious metals at a discount. 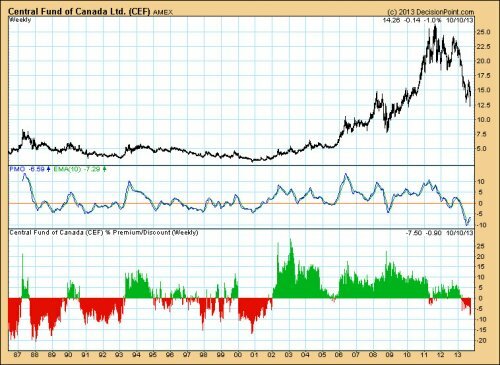 Central Fund of Canada (CEF) is a closed-end mutual fund that owns gold and silver exclusively — the metals, not stocks — at a ratio of about 45 oz. of silver to 1 oz. of gold. Closed-end funds trade based upon the bid and ask, without regard to their net asset value (NAV). Because of this, they can trade at a price that is at a premium or discount to their NAV. By tracking the premium or discount we can get an idea of bullish or bearish sentiment regarding precious metals. Very recently CEF has been selling at about a –7.5% discount to the net asset value of the gold and silver it owns. Considering that CEF has experienced a -54% decline from its 2011 top, that is a remarkably small discount when compared to historical discounts of -15% to -20%. Even more remarkable it the fact that after the -50% CEF correction in 2008, CEF was still selling at about a +15% premium!